The recent promise by President of the New Democratic Party (NDP) Arnhim Eustace to grant Garifuna people in the diaspora honorary citizenship is irresponsible and reckless. âPersons who want to misinterpret what I say and put any political spin they want on it can do so, but let me just say this up front. Citizenship is a serious business; it cannot and must not be tampered with lightly, willy nilly, nor with irresponsibility and recklessness,â Gonsalves said. Gonsalves, who was speaking at a press conference at Cabinet Room, said the proposal by Eustace is irresponsible and reckless, both in principle and in practice. âHe purports to want to tamper, because he canât tamper with it, because he doesnât have the office and it is unlikely he will get the office to tamper with it. Because I think the Vincentian people will show great displeasure at the polls with this proposal which he has put forward,â Gonsalves said. On May 31, at a town hall meeting in New York, Eustace declared that if elected to government in the next general elections, he would grant honorary citizenship to all Garifuna in the diaspora, wherever they may be. However, Gonsalves said Eustaceâs proposal was done âon the run,â in an opportunistic manner. The Prime Minister said citizenship is a bond between persons and that there are clear ways in the Constitution and the laws of the country and accepted internationally as to how one obtains citizenship. Gonsalves said on the issue of citizenship of SVG, he approaches the subject judiciously and in a quasi-judicial sense. He also declared that citizenship cannot be obtained by way of ethnicity. âTo show you how this makes no senseâ¦. You going way back now, five, six or more generations from the latter part of the 18th century, where you have no records to show the lineage. A Vincentian who is born and bred here of whatever ethnicity and has a grandchild overseas, that grandchild canât be a citizenâ¦ Now, would anybody think that this could ever be considered a serious proposal?â the Prime Minister questioned. ââ¦It is a foolish proposal and if anybody canât see that, something wrong with your reasoning. I believe if youâre in the Opposition so long and you donât have anything to say, you start to get desperate, which donât make any sense. The vast majority of the people in this country know that what I am saying to be true. 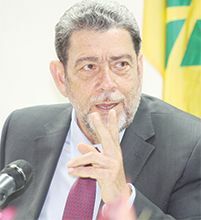 You have some people who know what Arnhim Eustace saying is folly, because they support him, they jump on the bandwagon of follyâ¦,â Gonsalves said.